I so often say these words to clients: Bring it to now. There are so many brilliant ways to apply this phrase to step into greater ease, to drop torments, to teach yourself your life is manageable—in short, to set yourself free. Some examples follow, but I invite you to come up with your own, and lots of them. Apply this to anything! How do I deal with the overwhelm of this huge, horrible challenging project/assignment/creation I'm up against? By dealing with the part of it that's before you right now. Don't deal with the whole thing from start to finish. Don't deal with tomorrow's part or next month's part or the part you have no idea about five steps down the line. DON'T EVEN CONSIDER THE OUTCOME. Deal with the one doable part before you here and now. Sometimes, it's time to look at the whole, get the overview, map it all out on a timeline, define and delegate the parts, and so on. In that case, the one task of the moment is taking that bird's-eye view. Then and only then do you need to get out the whole kit and caboodle and spread it out for your perusal. But notice how often you do this out of turn, checking again to rev up the angst and to make gloomy-doomy predictions for a bad end you don't want! Bring it to now: do what's really up for you to do right now, and bring your best presence and greatest sense of ease to that endeavor. What do I need to work out about my past? Nothing—unless something from your past shows up right now. Then meet it head-on. Meet the pain, meet your thoughts that intensify the pain, ferret out anything you've decided about life, yourself, or other people because of that story you lived. (“Mind the Pain Body, Tend the Mind” is the substantial and super-practical third chapter of my book Scooch! that treats this topic.) I've come to phrase this, The undoing happens in the moment. That moment is now. All you need to process you pain well and untangle the stories it's tied to; all you need to live your life well (and joyfully! ); all you need to get your needs met—it's all right here, right now. How do I stop dreading the future? Bring it to now. Is there something you don't like right now? Be with that. Be with it well. Be with it kindly, and don't tell yourself any lies. That's enough. When you're energized and excited about your life and all that's possible, all you'd like to create and connect to next—that's a fine now moment to take a little trip into the future, and then come on back to consider how to point yourself that way right now. When some small embarrassment or warped, oversized shame-thing grabs you (we've all got one, we've all had one activated in the not-so-distant past, maybe earlier today), come back to now. What are you in charge of now? What can you control (that's truly in your realm of control) right now? Can you forgive yourself more deeply right now? Can you soothe yourself like a kind, loving parent practicing unconditional love right now? Can you get out of someone else's head and what they saw and what they thought and what they think of you right now? Bring it to now, and see how much kindness you can step into in this moment. Quit dragging yourself back to some shameful, painful, confused moment that does not (it absolutely does not) define who you are. I love how Byron Katie says that she loves being slapped, because it's over. The slap happens once and fades quickly, but we replay it again and again mentally, reliving the shame and all that a slap in that moment from that person before those witnesses means to us. She points out that the person who slapped us once turns out being much kinder to us than we are to ourselves, because we slap ourselves a hundred times over. Come back to now and what's actually happening now. Come back to the kindness of the moment. How do I keep all the turmoil in the world or political process from getting the best of me? Bring it to now. It's fine and good to have times you witness what's happening in the world, but never forget that the news isn't giving you a balanced view of things, and don't keep hanging out in the dismal spot it last took you to. Remember that the media displays the most provocative and sensational of what's happening out there, always slanted a certain way in the presentation. When you're not consciously seeking to be informed as best you can, get present. Life is also a sink full of dishes, a walk with the dog, a moment to listen to your kid tell you something you wouldn't even care about for a moment if it weren't this particular human being doing the telling. Life is a good cup of coffee, a dance down the hallway, a moment of hard laughter over the purely absurd. Get present to the mundane beauty and magic that's right here, right now, and truly validate and value it: this is your personal life, the specific one you were given to tend, yours to mind in the moment with as much love and presence as you've got, even as the storms happening out there rage and simmer on. Get out of tomorrow. If you must review what needs to be addressed tomorrow, do it before you even enter your bedroom, never mind climb into bed. Get out of today, but do that after you've spent a bit of time going over triumphs and completions large and small. Notice with appreciation all you did that was good, or brilliant, or even good enough. Take a moment to feel and really take in what you moved through and brought to the next step or even to a close. (Do you, like most people, deprive yourself of acknowledging and celebrating what you've accomplished?) You might also notice all the kindness that came your way. Byron Katie taught me to notice all that supports me. Start counting the supports that came to you today, and it may be hard to stop. Did clean water really just come out of a faucet because you turned a knob with minimum effort? Once you've been with the day in that way, let it go. Come back to now. Find how the mattress supports you, how the pillow allows you to let go, how the blankets envelop you not just in warmth, but a sense of safety and well-being. Find how the darkness holds you. Imagine you're lying in the arms of love. Let go of every muscle you don't need (all of them) for holding it together right now and let yourself be held. Let go of thoughts, even if they won't let go of you, by not following them sequentially. Get off every thought train you catch yourself in. Come to love the unfinished thought! Use the breath to support you. Drop your awareness into your belly (not once, but again, again, again, now, now, and now) and watch the belly go up and down with the breath. Find what's soothing and kind and life-giving in your breath. There's nothing like connecting to the breath to help you connect to here and now. My book Scooch! can further support you to bring it to now. I mentioned, in the article opposite, my book chapter called “Mind the Pain Body, Tend the Mind.” The book also contains elaborations on other things I touched on here, including material on living in joy now, managing (and moving along) guilt and shame, practicing self-love (and lovingly putting yourself to bed), living in a self-referential way and in good standing with yourself (instead of being preoccupied with what others think of you), stepping into greater personal power, and more more more more more. Thank you again to those who've posted reviews on Amazon! If you'd like to support bringing my book from obscurity into some sun-drenched place that's visible to more people, follow this link for instructions on writing a review on Amazon. You can also recommend the book on Facebook with a link to the Amazon book page or my book page. You could buy it to give as a holiday gift (or anytime!) (for winter holidays, order by Sunday before Thanksgiving to be safe, though I currently have some books on-hand and send them quickly as orders come in). I'd appreciate your doing anything, whatever else you think of, to help spread awareness of my book, currently mostly a well-kept secret. My intention is that Scooch! would support you and many others in kindly, gently moving onward in a journey of healing and evolution. I've revamped some of my coaching structures and my coaching page that guides you through them. Check out some new ways to work with me one-on-one. I'm excited to offer half-hour sessions for those who prefer the quick-and-efficient thing. I've learned from recent good experiences that it works: you grab the sound bites that serve you and go; we meet again soon (weekly is great) so you don't lose track of what we're up to. On the other end of the spectrum, I've got a new option for super-coaching for those who have done some work with me already and want me to stay very close to their process for an intensified brief time. This allows them to bring the concepts and intentions we're working with to a whole new level of ongoing application, as I talk you over the wave cresting right now! This is a new dimension of my work that came in unexpectedly and allows for a level of working with people that I find deeply satisfying and they're finding super helpful. If you're drawn to coaching but don't see how it fits into your budget or life, I guarantee that my book contains hours' worth of coaching that you're entirely capable of applying yourself. The trick is simply to apply it, and that happens now and now and now. I took an unplanned break from Facebook after my physical book showed up and asked for my attention. Now, I've found my way back on chiefly through Facebook Live, which captures videos taken in the moment. 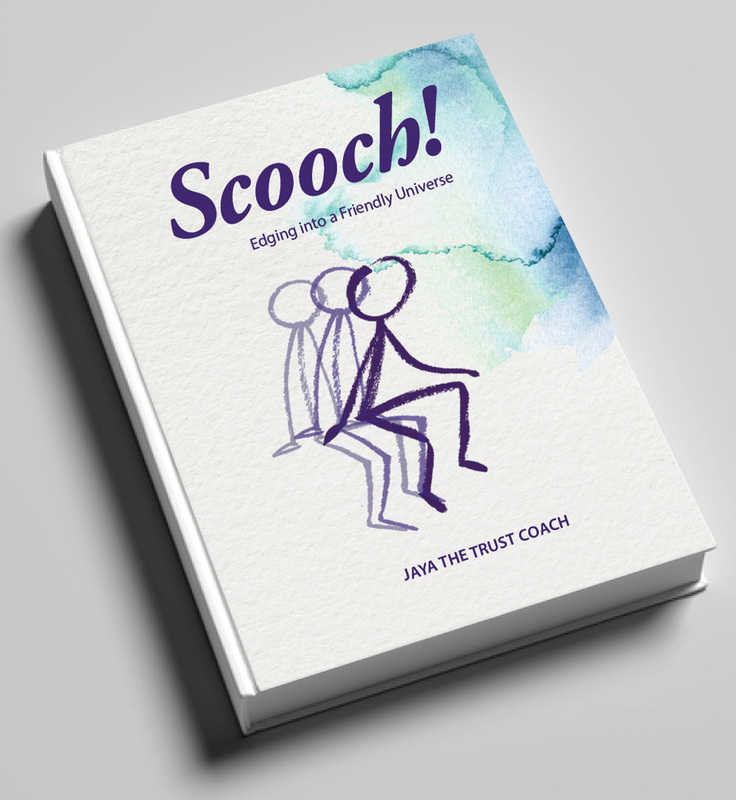 I'm using this feature to read excerpts fromScooch! I started out making longer videos following the advice of marketing experts. Then, as usual, I found how it actually works for me, which, it turns out, is to make very brief videos offering a small segment divination-style, opening the book at random and reading what comes up for the day. I'm shooting for 11:11 a.m. ET most days. (After that, they're posted on the page and show up in the news feeds of the folks FB randomly decides to serve that day.) Please like, comment, or share, as Facebook serves to more people as viewers respond. Unless you don't want to, and then please don't. I trust all the right things will land in front of all the right people. Go back to other articles and audio programs. Invite me to present to your group. Do you know about my daylong one-on-one retreat breakthrough program?